The Utah Review looks at two events from local museums: Site Lines, The University of Utah Art Faculty’s exhibition at the Utah Museum of Fine Arts (UMFA) and a recent video presentation at the Utah Museum of Contemporary Art (UMOCA) that was held in connection with a national conference of funeral directors held in Salt Lake City. 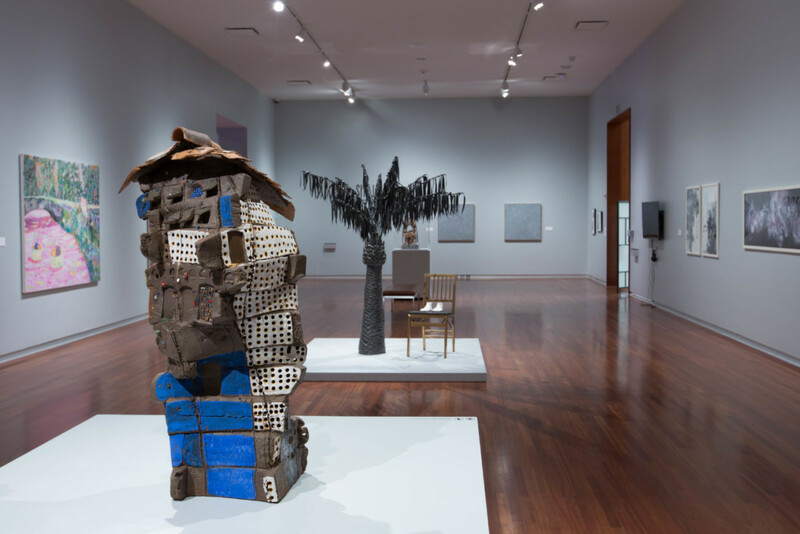 Every three years, artists who are on The University of Utah faculty participate in an exhibition at the Utah Museum of Fine Arts (UMFA) that covers traditional as well as unconventional media of expressions. At some point, every university faculty member on a tenure track is expected to account for a substantial record of publications and research that contributes substantially to a specific discipline. In the case of artists, then this year’s show Site Lines, which opened last month, offers a good compass to see how these artists are cultivating their creative fields in ways that are analogous to what their peers in other disciplines are expected to produce. Felicia Baca, the show curator who comes from the Utah Division of Arts and Museums, says the show’s title plays on a phrase familiar to architecture – the function of the sightline which preserves a specific line of sight for an important or meaningful space when a new building is designed. Likewise, site in this instance can refer figuratively and metaphorically to the idea of space of social and cultural significance and value. Thus the artists variously approach this thematic concept in concrete and metaphorical ways that not only divide but overlap sites and spaces – nature and human-made structures, text and imagery, abstract and representation, the creative discipline of art and other disciplines including science, biology, chemistry, political history and other areas. There are more than 40 works from 27 artists and the manner in which Baca has curated and positioned the art pieces in the exhibition enhance a viewing experience with some pleasant surprises in stimulation and sensation. 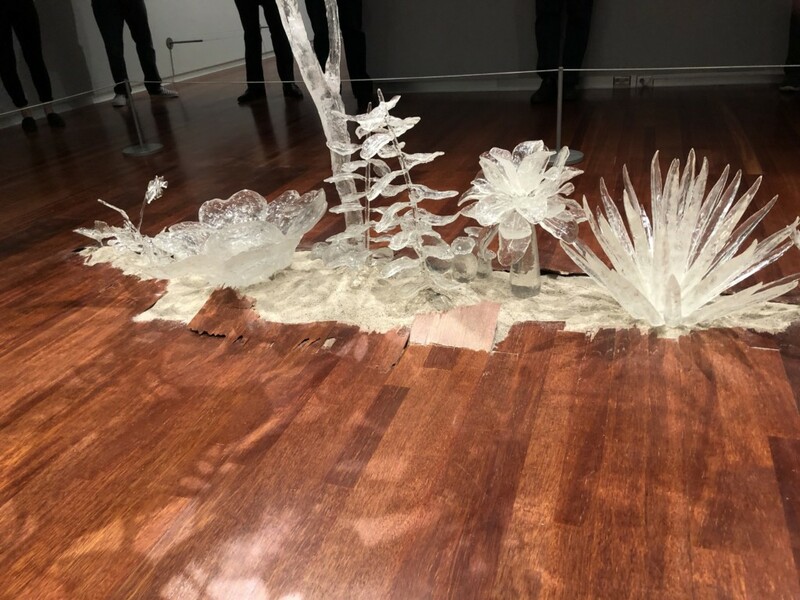 An excellent example comes in one gallery where two multimedia installations, arising from different orientations and intentions, are at opposing ends. 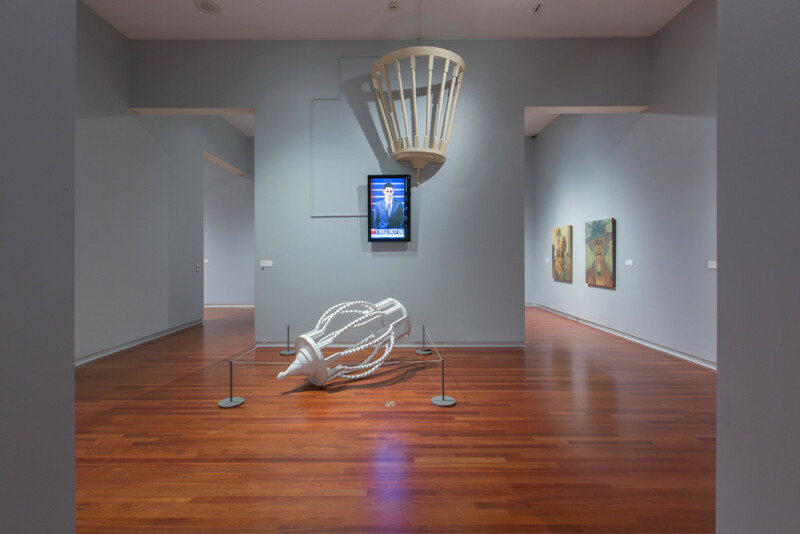 At one end is Kelsey Harrison’s sculpture and video installation, an incisive expression of the American political tradition in a benign yet unflattering form. She incorporates elements of a balcony and other official building architecture that symbolize, in part, the authority and hierarchy of political power. In the video, the artist appears in a suit and tie, as a U.S. president would in a State of the Union address before a joint session of the U.S. Congress. The speech strings together actual excerpts from such speeches, which makes one realize just how similar the platitudes of political rhetoric are, regardless of the political party affiliation of our leaders. Returning to an earlier point, it is a serendipitous juxtaposition of Harrison’s and Wischer’s work that gives the viewer a curiously visceral reaction in walking through this particular gallery, hearing political speech fragments on one end while simultaneously picking up the haunting poetry from Wischer’s work. Bateman goes on to explain that this series departs from his previous focus on images modeled digitally, as he has returned to the tangible roots of his formative work. As in Wischer’s work, the effect is intoxicating and the viewer quickly realizes the photographic prints create a visual response that extends well beyond the simple realm of a dying leaf. 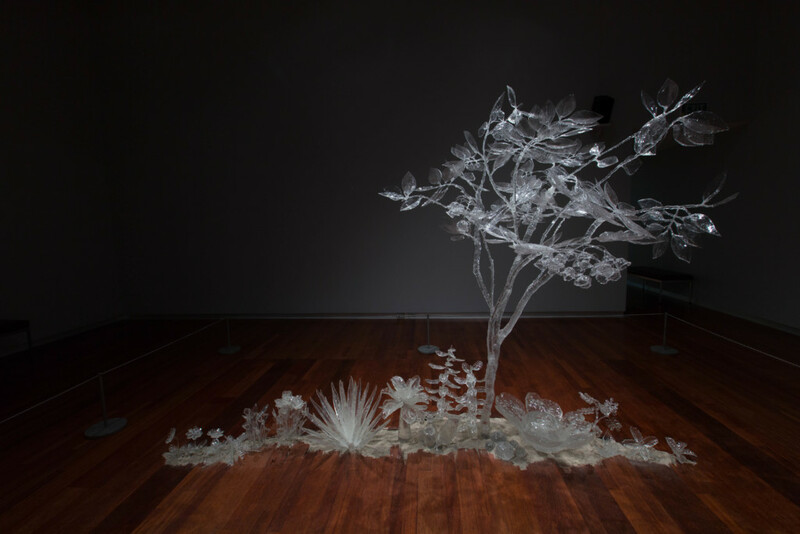 Bateman, who served as the faculty liaison for the exhibition, has been widely recognized for combining 3-D computer modeling with sculpture photography. Also notable is Beth Krensky’s Float Away, a mixed media presentation, which includes kites and a video that runs approximately five minutes. The work pays tribute to her deceased mother – a ritualistic expression of creativity. 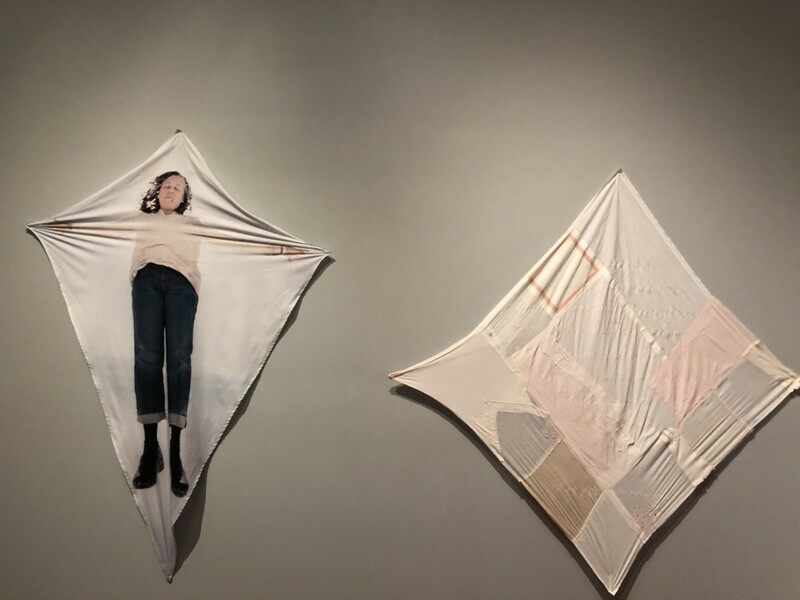 With assistance from Jill Moyes who assisted with embroidery and sewing, Krensky created a kite from pieces of her mother’s clothing and then flew it along the shores of the Great Salt Lake. On the kite was embroidered text, encompassing a message that the artist hopes her mother would see, which begins, “I will release my last desperate grasp on you and allow you to float away.” The video, with videography by Josh Blumenthal, shows that flying the kite was not always a successful but more often an awkward and cumbersome exercise. It is a realistic yet graciously dignified reflection on tribute and memory of a loved one. The exhibition continues until Jan. 6. In connection with the exhibition and UMFA’s Third Saturday for Families program, museum staff will give visitors a chance to create their own set of prints, as inspired by the Site Lines exhibition. 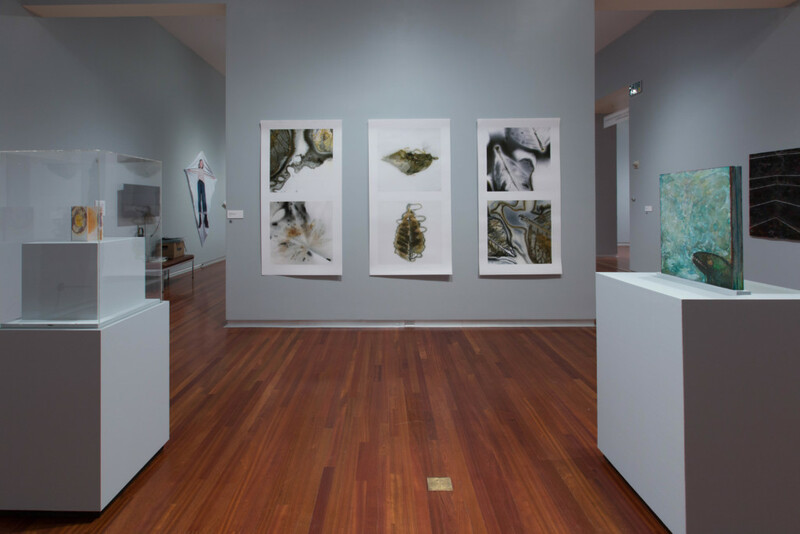 Site Lines is sponsored by the University’s Arts Pass program, which allows students to use their UCard to obtain free or deeply discounted access to hundreds of arts experiences on campus each year. Additional support is provided by the College of Fine Arts and the department of art and art history. For more information, see the UMFA’s Site Line web page. Last February, the National Funeral Directors Association (NFDA), which recently held its annual convention in Salt Lake City, collaborated with the Milwaukee Filmmaker Alliance, to hold the RememberingALife.com Film Contest. By June, 87 professional and amateur filmmakers from seven countries (Australia, Austria, Iceland, India, Kazakhstan, Namibia and the U.S.) submitted short films, all under five minutes in length. The films covered a wide range of thematic treatments and artistic approaches and while many commemorate the life of a deceased loved one, others paid tributes to those who still living. Cash prizes went to the top three juried selections and the films were screened last summer at the Milwaukee Film Festival. A Brief & Concise History of Things and Other Things, Sidney Butler. The NFDA brought the top nine films to Salt Lake City, which were screened continuously during a couple of days in the Utah Museum of Contemporary Art (UMOCA) auditorium. The three winning films have a distinctive artistic feel in the presentation as a short documentary. Sidney Butler’s A Brief & Concise History of Things and Other Things is a 99-second fast-paced montage timeline of personal family, pop culture, and historical images with narration explaining the lasting impact of her grandparents and the events in which she and her family have observed. Butler, who graduated recently from New York University’s Tisch School of the Arts, also was a 2018 Sundance Ignite Fellow. Adrian Burrell’s Tio Lino, which took second place, is set in a Brazilian favela and recounts the story of an old man who worked hard to improve the lives of youths in his community. Burrell, who is based in California, is known for producing and casting producer and casting director on Licks, a 2013 award-winning narrative feature directed and written by Jonathan Singer-Vine about a man who returns to his Oakland roots after serving time in prison for a failed robbery. 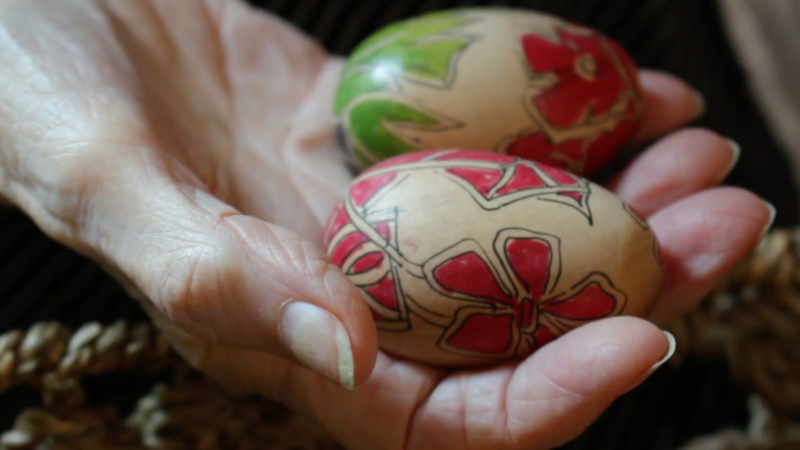 Austin Meyer’s short documentary piece about Shari Kadar (Art Can Save You | The Story of Shari Kadar and 1000 Colored Eggs), who was born in Hungary during the 1920s and came to the U.S. as a refugee during World War II, is a visual treat. Kadar quit her job to devote her life to her genuine passion as an artist and produced 1,000 beautifully colored eggs. Meyer captures Kadar’s words with impressive grace and dignity. A journalist and documentarian, Meyer is completing a documentary film he shot for five months in Zambia about infant and maternal healthcare, which was funded in by a National Geographic grant. The six honorable mentions are worthy submissions. In the film about Mark Pittman, a former Bloomberg News journalist, director Perlin Kuo captures the bittersweet humor of his widow and children who go on a trip to honor him after his sudden death. They carry his cremated remains and the widow recalls how she tripped over a log on the way to an outhouse and the container with his ashes spilled some of it. She could taste the ashes in her mouth so she swallowed them. It was then when the family decided they would scatter ashes at various points in their journey as their tribute. 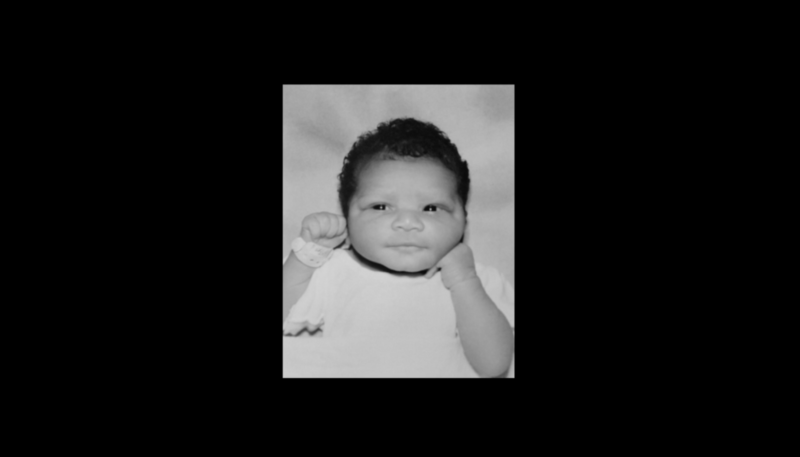 Cookie and Queen, directed by Nicholas DeRose, is one of the films about individuals who still are alive. They are a couple who have been married for more than 60 years and they definitely are still enchanted by each other just as when they started dating. Art Can Save You | The Story of Shari Kadar and 1000 Colored Eggs, Austin Meyer. Two films focus on veterans but not on their military service specifically as their legacy. Edward Wood: A Life Well Lived, directed by Stanley Arthur, is an informative understated piece about a World War II veteran who participated in the Civil Rights Movement. A Life Remembered: George F. Banda, directed by Zaria Perez, pays tribute to a decorated Vietnam War veteran, who remains active as an advocate on care and treatment of Post-Traumatic Stress Disorder (PTSD) for his fellow veterans. A recipient of the Silver Star and Bronze Star, he is known in Wisconsin for his work on behalf of Latino veterans and for helping establish the Wisconsin chapter of the American GI Forum. The films represent individuals of various ages. This Is honors the life of Payton Parrotte, the best friend of Jackson Snorek who died by suicide in high school. The Rockford Lutheran High School graduate produced a mature sensitive, loving tribute dealing honestly with grief and the tribute of keeping his late friend’s memory close to him. John Claude Kraus: A Retrospective, directed by Todd Bowie, highlights the life of a Wisconsin artist and the lasting impact of his influence even more than a decade after he died at the age of 45. The jury for the films comprised Yair Agmon, author and filmmaker; Thomas Lynch, a funeral director who also has gained significant acclaim for his poetry and essays including the collection The Undertaking: Life Studies from the Dismal Trade, and Lani Simeona, production co-director of the Full Frame Documentary Film Festival. The films are available at RememberingALife.com.